Leonard Lopate will be joined by some of his favorite New York luminaries. Actress Jill Clayburgh and Tony Award-winning playwright David Rabe will discuss the balancing act of being a creative couple, and the different kinds of support and feedback that are required; Joy Behar will dish on co-hosting The View, guest-hosting Larry King Live, and her recent turn to writing fiction; and Grammy Award-winning pianist Richard Goode, who has just released a recording of Beethoven’s complete piano concertos, will perform live. 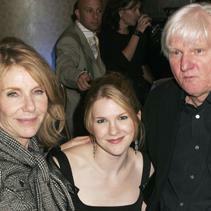 Screenwriter and playwright David Rabe and actress Jill Clayburgh, who have been married since 1979 and have a daughter, the actress Lily Rabe, talk about their careers and the creative exchange that happens in a family. Joy Behar discusses working with the opinionated women of “The View,” politics, guest hosting “The Larry King Show,” and why she’s written a children’s book, Sheetzu Caca Poopoo: Max Goes to the Dogs.